V317: 1740s Riding Habit - Nearly There! 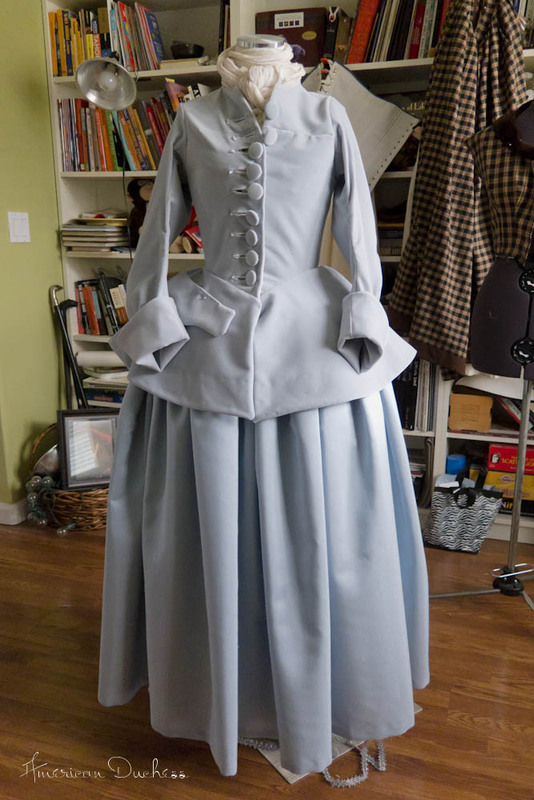 Yesterday I made the petticoat and set the sleeves on the riding habit jacket. 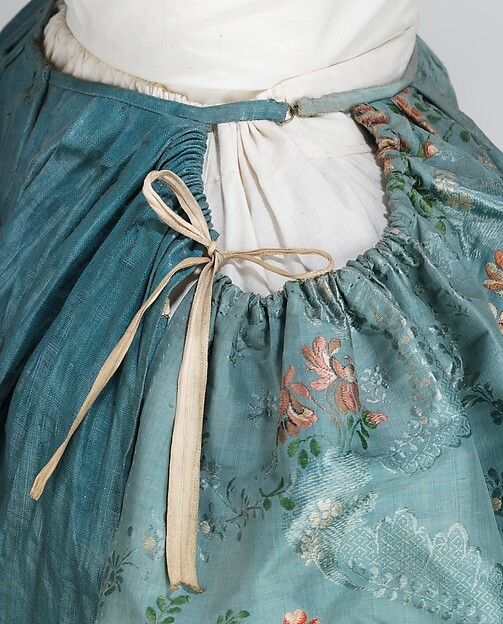 The idea is that the length and fullness of the petticoat can be adjusted over the panniers, and you should be able to wear this type of petticoat over different size panniers, or no panniers at all. I made the petticoat the same way as usual, with the sides open, but I left about 10 inches free on front and back, each side, and stitched in a drawstring. The waistbands stop short of the gathered lengths, so they form a hole on each side. It seems to have done the trick - hem looks level, yay! Next it was time to get set the sleeves in the jacket, and, of course, I ran into problems. The sleeve heads were 19.5 inches around, and the armscyes considerably less. I wanted a smooth cap, so I took off the armscye through the underarm and the back, then eased the sleeve head ever so slightly with a gathering stitch. Mission accomplished there, but I'm going to reduce the sleeve head on the pattern before I sew with it again. What an awesome, sneaky little trick. 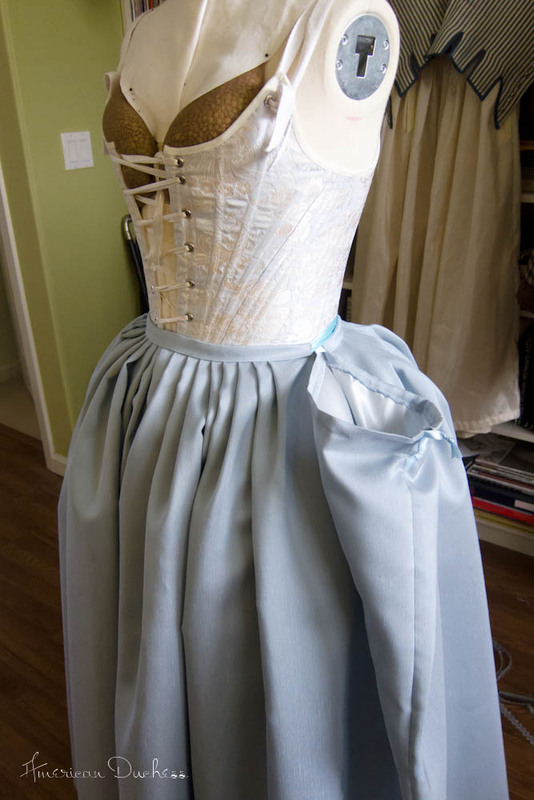 I have an underskirt that I was planning on rebuilding, I think it's getting this treatment for sure! Haha, a "sneaky little trick," made me laugh! not easy stuff to work with but it looks great. Can't wait to see it with trim. I know it sounds odd to say it but I find this style has a real 'old fashioned' look to it when compared with the later polonaises. Wow, great, great work! And you work so quickly! (Glad you liked the drawstring skirt openings for panniers idea. They just blew me away.) The ensemble is just breathtaking, even without the trim. Do you wear a hat with it? Hi Nancy. Thanks! I have a little black tricorn I need to trim out, to go with this, along with black Pompadour shoes. 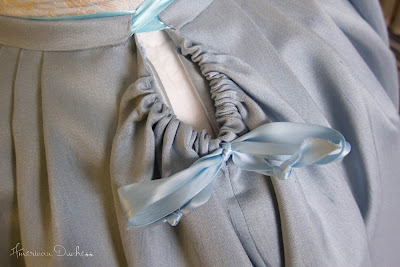 You're right about the sleeves - it's better to cut down than to splice something in! It looks SO good! Beautiful and elegant in its understated condition at the moment. Are you going to do vertical or horizontal pocket flaps? (or whatever they're called.) Can't wait to see the trim on! This is really coming together well. I can't wait to see what you do with the trim. 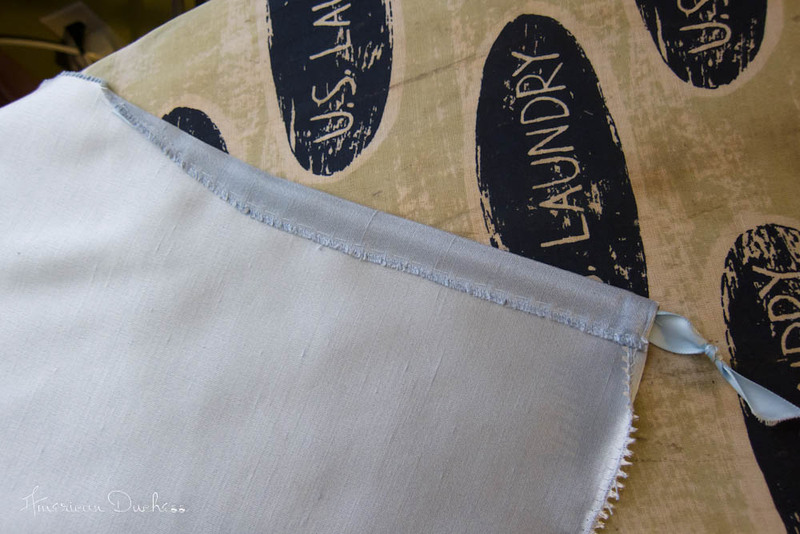 The gray-blue is absolutely lovely and elegant, and a great canvas for some creativity with the trim. It would be neat to see it done up with various sized paniers too. The no panier look is I'm sure the most practical for actual riding, but the wider paniers give it drama and a dynamic quality that is similar to the paintings you posted last time. Are you planning on doing more riding habits in the future? Hi Rachel - I agree! I was wishing I had some wider panniers to try this on. I guess I shall have to make some. 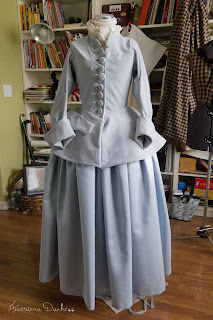 I think it would look even better, because the spread of the skirtings on the jacket seem to ask for width. I probably will make other riding habits in the future. I find them so sophisticated and stylish, and I like the way they changed throughout history. I really like the idea with the drawstring! Must be tested! I love riding habits! This one is looking gorgeous already! Well done! You are made of so much win. Looks gorgeous!! I saw something interesting on an original 1860's bodice I found. I know it's 1860's not 18th century, but it addressed the too-big sleeve issue in an interesting way. The sleeve was smooth over the shoulder, but under the arm it had a neatly made little inverted box pleat to tame the excess fabric. I thought it was a unique way of handling the situation.